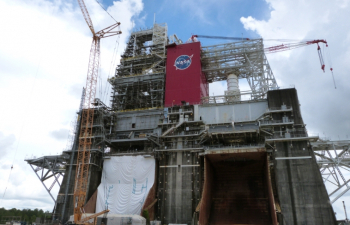 The NASA and contractor workforce at Stennis Space Center are nearing completion of structural work on the B-2 test stand that will be used for the Green Run test of the Space Launch System (SLS) Core Stage before its first flight. In addition to SLS Core Stage testing, planning is now also underway for the stand to support a similar “green run” test of the Exploration Upper Stage (EUS). As structural modifications are finishing, work to activate the test stand is increasing and the test team is beginning work to define Green Run procedures. “We are near completion of what we would call restoration and buildout of the test stand – the removal and replacement of parts and existing structure,” Travis Martin, Lead Systems Engineer for the SLS Green Run Test Project, said in an interview with NASASpaceflight.com. “That is coming to completion at the end of this fiscal year. 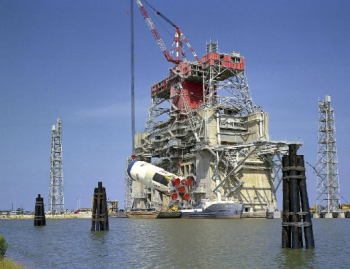 The B-2 test stand was originally constructed in the 1960s and first supported testing of the Saturn V first stage, the S-IC. It was also used to test the Space Shuttle Main Propulsion Test Article (MPTA) in the late 1970s and early 1980s and in more recent times the Delta IV Common Booster Core in the 2000s. 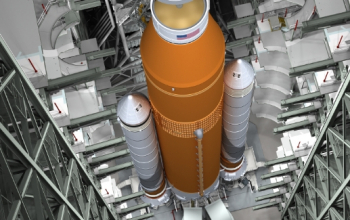 Buildout of the stand was required due to the length of the SLS Core Stage, which stretches to almost 212 feet from the top of the forward skirt to the exit plane of the four RS-25 engines at the bottom. In addition, the stand was configured for the off-axis, side-mounted Shuttle MPTA thrust; the MPTA thrust structure was therefore out of position for the inline SLS Core Stage. Rather than demolish the existing structure and build a new one, it was decided that it would be more cost-effective to move the existing MPTA structure about twenty-feet to an inline position and then renovate it. The move was completed in August, 2014. While the structural work continues, Mr. Martin noted some of the subsystem activation work also beginning. “The first item that we’ll focus on when it comes to activation of the test stand is the data acquisition system,” he explained. “Currently, we have completed installation of all the new data acquisition hardware that is specific to B-2 and we’re going to upgrade the rest of the site with the same hardware. “So that’s the actual data acquisition system, recording hardware, all the sensing lines up into the interface boxes before we actually connect to a wire to the Core Stage. We started activation on the LOX vent system, that’s a shared system between B-1 and B-2. Martin also noted that Stennis has completed renovation and activation of a Shuttle hydraulic skid they received from Kennedy Space Center (KSC) ground operations. The B-2 test stand work is to get ready for a major development milestone for the SLS Core Stage, the Green Run test, which will essentially fly the Core Stage in place on the test stand through a nominal, eight-minute launch and ascent. Green Run test activities will involve several firsts, including the first cold flows, the first full tanking, and the first hot fire of the four RS-25 engines integrated with the Core Stage propulsion system. 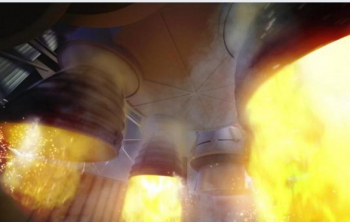 Given all the firsts, the plan is for the Core Stage to be at Stennis for several months. “We still expect to see the Core Stage for September 2017 arrival and we expect to have the Core Stage anywhere between six to eight months,” Mr. Martin said. “A modal test is, let’s say, a vibration test to determine the resonant frequency of a structure or part,” he added. “We’ve already characterized the test stand and we want to insure that the Core Stage resonant frequency is not coupled with the test stand. In a general overview of the Green Run operations with the first Core Stage, the outline also includes a key element of the Shuttle era, the tanking test, ahead of firing up the engines. “If all goes well with that hot-fire test, then we plan to do the standard refurbishment needed to the Core Stage, defined by an integrated plan between [NASA] and Boeing, and then we’ll put it back on Pegasus and send it on to KSC. “If we deem it needed by analysis there afterward, we would do a second hot-fire test before removing the Core Stage from the test stand. “Between modal test and wet-dress [fill and drain test], there are a number of subsystem checkouts, so we’ll do thrust vector control checkouts [and] we’ll do vehicle power-up checkouts. Work on the detailed operations plan for the Green Test began this month, which will be finalized via simulations of the test procedures. “Starting in September, the Stennis operations team including myself and the Boeing operations team will start developing that integrated plan and procedure and we will in the future walk-through and go do simulations of [the plan],” Mr. Martin noted. 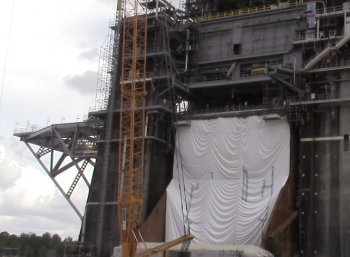 NASA is planning on a month’s worth of refurbishment work on the stage at Stennis after the full-duration hot-fire, including standard engine servicing and making any repairs necessary to the stage’s thermal protection system (TPS). 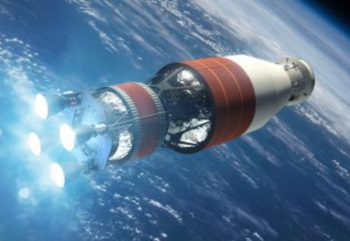 “We’ve added additional personnel access structures to the engine servicing level for the Aerojet Rocketdyne personnel to do what they need to do to the engines – to refurbish, plug them up before we actually put it back on the barge,” Mr. Martin noted. Prior to the arrival of the flight unit, Stennis will get an opportunity to practice handling a Core Stage when a pathfinder article arrives there on the Pegasus barge. “The expected delivery date of the Pathfinder vehicle is July 2017, a few months before the advertised delivery date for the Core Stage,” Mr. Martin said. Currently under construction, the Core Stage pathfinder will have the same dimensions as the flight units, along with the same handling attachments and umbilical plate locations. “We want to do three major things with the Pathfinder: we want to practice the lifting procedure, which is the lifting and breaking over of the Core Stage, we’ll practice that with the Pathfinder multiple times. Also, inserting the Pathfinder in and out of the test stand itself, verifying structural clearances, at least three times or more. “We also verify our umbilical carrier mechanisms – we want to check the alignment of those.” The Core Stage has four umbilical panels where services are supplied to the different subsystems – one on the forward skirt, one on the intertank, and the two on the engine section. When it comes time to load the stage for the Green Run “wet” tests, it will take much of the infrastructure at Stennis that supports testing hydrolox engines and stages. 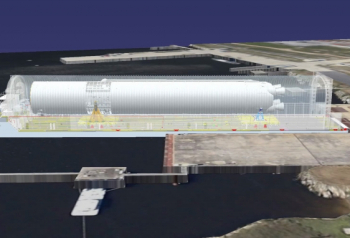 “Here on site we have four LOX barges and three [liquid] hydrogen barges; all those barges plus a topping tank – that’s a ground tank for liquid oxygen — will be needed to conduct the Green Run test,” Mr. Martin explained. “The worst-case is not the hot-fire test, the worst-case is the tanking test, and that requires from start to finish about 22 hours of supplying of gases to the Core Stage,” he added. This includes not just the cryogenic propellant, but also things like hydraulics and purge gasses. “We will fill every barge to their capacity or just above that to maintain margin. We will overfill our high-pressure industrial water reservoir, so we’ll have margin there. 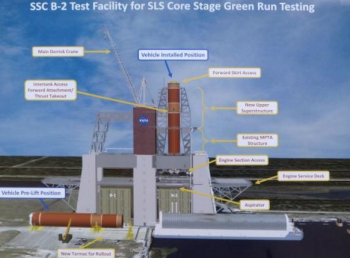 Plans are for the first two Core Stage flight articles to go through Green Run testing at Stennis. With the EUS (Exploration Upper Stage) development beginning to proceed – with the preliminary design review is in December – the current plan is to modify and use the B-2 stand for that stage when the time comes. Since EUS will fly on the second SLS launch, both hydrolox stages will need to be fired at Stennis before heading to KSC for launch processing; however, the timeline and order for that is still to be determined. “It has not been determined if the upper stage will be tested in between Core Stage 1 and Core Stage 2,” Mr. Martin explained. “If so, then the test stand will stay in an active status.